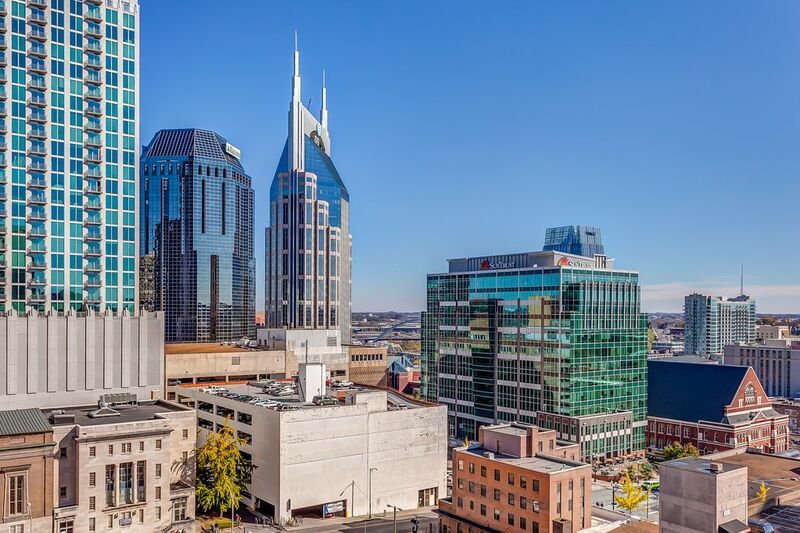 Your stay in this upscale apartment in downtown Nashville will be so nice you won't want to leave, but it's so centrally located amidst a slew of iconic country music sites that you get to enjoy the best of Music City without going far! Head on down to the Country Music Hall of Fame just blocks away to brush up on some music history, then take in a concert at nearby Ryman Auditorium or Ascend Amphitheater, with events almost daily. Then come home to this spacious 2-bedroom, 2-bath apartment, relax in its fine furnishings and gaze out floor-to-ceiling windows. Hit the gym, play some pool, or just sit around the courtyard firepit – your building features amenities galore! Authentic Southern BBQ plus live music and dance lessons! Prohibition-influenced craft cocktails and a burlesque show. Stay Alfred was founded based on the idea of offering innovative, reliable, and consistent short-term vacation rentals at a price that's affordable, while making booking, checking-in, and checking-out quick, easy, and stress-free. Booking the perfect stay shouldn't feel like taking a shot in the dark. At Stay Alfred, we know that guests prefer accommodations that are straight-forward and stress-free. By booking with Stay Alfred, you are choosing premier travel accommodations. We never compromise on quality, comfort, or convenience because we understand that our guests expect, and deserve, the best. Each Stay Alfred property offers first-class modern amenities, attractive decor, 4-star housekeeping, unsurpassed location, and is equipped with all the comforts of home. In the heart of downtown Bellevue, you will be within easy walking distance of upscale dining and shopping, as well as nature trails, parks, and swim beaches. Many of our guests decide not to rent a car! Stay Alfred��s offerings are ideal for families and corporate travelers alike. No more staying on separate floors and no more sets of side-by-side beds. Our guests enjoy three times the square footage of an average hotel room. They enjoy having separate bedrooms and a real living room. They save money by cooking some of their meals in their complete kitchen. They have a washer/dryer, in case they need it. They get 5-star customer service from our team of dedicated hospitality experts. And the best part is, our guests know they’re getting all of those things every time, no matter where they stay with us. Your stay with us in Portland will look the same as your next stay in Seattle. Your booking, check-in, check-out will be the same in Denver as it was in Nashville, so you don’t have to wonder. Consistency is our key ingredient. Great condo, great location, close to Broadway, Bridgestone, and Music City Center. Secure building with 24 hour Stay Alfred front desk. Great location and the staff were all extremely helpful. This apartment is very close to the bars and restaurants on Broadway. It was a nice apartment, though a little dark. There were several light bulbs out, and not a lot of sun coming in. Otherwise, it was all good! Cathy, thank you for your review! We are thrilled to hear that you enjoyed the location of your unit. We are sorry that there were a few light bulbs burnt out during your stay. We hope to host you again and provide you with a proper 5 star stay. The condo was clean and very well maintained. As advertised, the condo was in the heart of the city. We walked to every venue planed for downtown. A quick and inexpensive Uber to Opry Land Resort. We enjoyed our visit to Nashville... loved - Bourbon Street Blues on Printers Alley. We loved the location and the building. The condo itself was very nice. The beds and the couch were both very uncomfortable. There were a couple of broken chairs in the dining set. The bat rooms and kitchen were great! Overall, it was a good place to stay. Thank you for taking the time to write a review. We are so glad to hear that you enjoyed your accommodations. We appreciate your valuable feedback as it helps us to identify the areas where we can improve the guest experience. Thank you for choosing our property and we look forward to welcoming you back. Very nice and clean. Great location. Would recommend this place Blinds in need of repair in bedroom. Had a great time. Great location to walk to our events at the Ryman and Broadway street attractions. Will consider staying here again when coming back to Nashville. Live like a local during your stay at the amazing Cumberland property, located in the heart of downtown Nashville. You’ll be right in the middle of all the action, within easy walking distance to fabulous dining, music, and dancing! Experience the fabulous nightlife that made Nashville famous! The Cumberland property is located at the intersection of Church St. and 6th Ave, just two blocks north of the famous Honky-Tonks on Broadway street. You couldn���t be any more downtown!